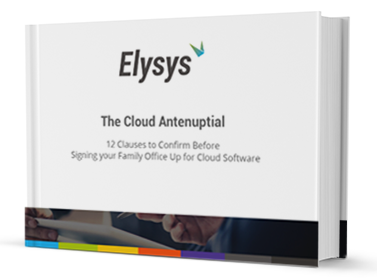 Are you tasked with investigating the how’s and what if’s of moving your family office’s software applications to the Cloud? Then this is a checklist you can’t ignore! Migrating financial and wealth management applications to the Cloud entails a number of risks. Decision-makers can pre-empt these risks, though, by asking the right questions before they sign up with a Cloud provider. Does the software require client installation or is it Plug and Play? Does the Cloud version of the software offer identical funtionality as the on-premise installation? Does the provider support easy scaling or switching between installation options, from Cloud to on-premise? Who will be creating encryption keys and which parties will have access to these keys? Please complete the form on your right to download the complete checklist based eBook.